First of all I should explain my absence over the past few weeks. A combination of no internet and a ton of work to be finished at home have stopped me getting online to update the blog, but I have managed to get fishing now and again. I have been concentrating on LRF from the shore in an attempt to boost my species count but at the same time keeping half an eye open for Bass. The Bass have been conspicuous by their absence so far. Lots of tiny Bass around but nothing of any size. Not sure why this is, but I will keep trying and if the weather ever lets me get out in the boat again I am sure we will find a few. Anyway, LRF. 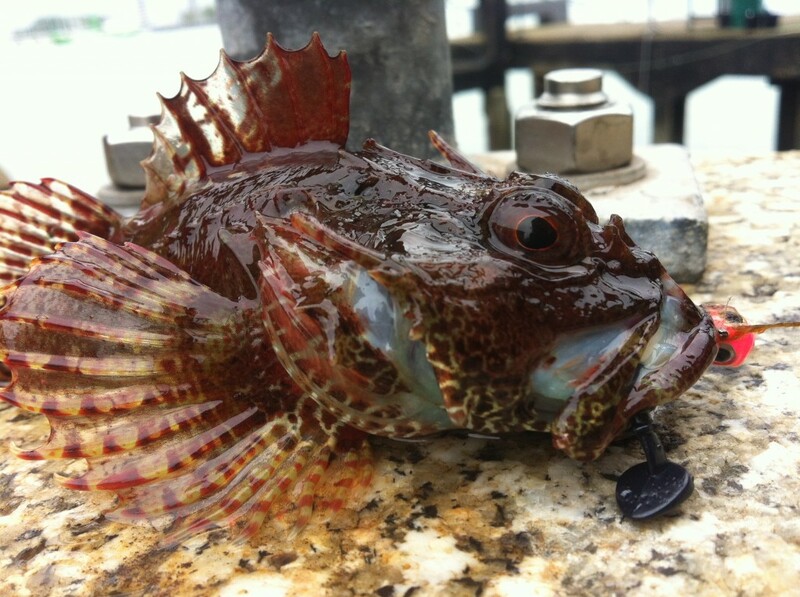 A few weeks ago I had a pop at trying to pick off a decent Scorpion fish so I hatched a plan and got amongst a few. Fishing weedless with small Reins paddle-tail plastics was the most successful approach and a good lesson that it's not all scented worm imitations when LRF'in. My thinking behind fishing weedless was two fold, firstly to avoid the really small fish and secondly because these fish like to hide amongst big patches of mussel and this can be a jig-head graveyard. 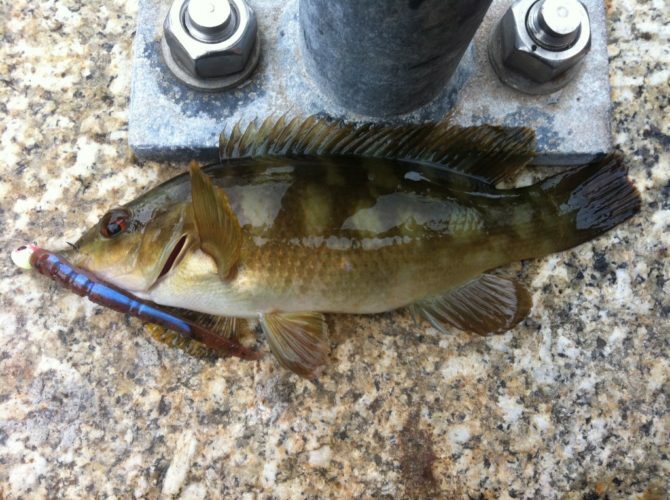 I am convinced I can often feel a mussel close its shell around my lure should I happen to lower it through some of the shell-fish and it's a lottery to whether I get my gear back or not. I have only started to tune myself in to shell-fish bites since using my Graphite Leader Calzante EX LRF rod, which is as sensitive as a teenage girl! Getting back to the Scorpions, I didn't manage the huge fish that I know are around, but certainly had a few PB LRF Scorpions and I am happy with that. 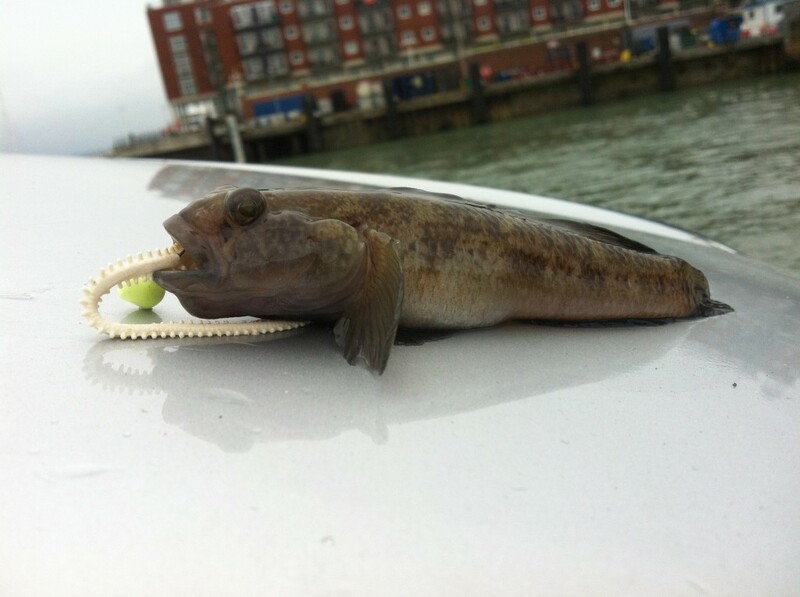 Gobies are bread and butter if you LRF around harbour walls and are a great species to fish for with kids or if you are new to LRF and like me a few years ago just need to get used to using the light tackle involved. Gobies were my LRF apprenticeship and I still love to wander around with a packet of Power Isome / Berkely worms in my pocket looking for mister Goby. 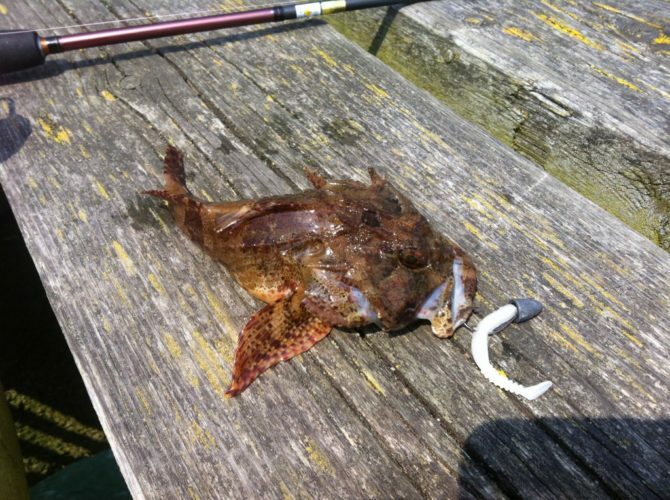 This Rock Goby was of interest only because its a specimen(!) and the photo demonstrates the kind of areas LRF can take advantage of. The apparent lack of Bass (for me anyway) has made room for lots of Pollack and way more than the past few years on my usual marks. Lots of fish in the half a pound mark and a few bigger that can provide great sport and often distract me when I intend on leaving them alone! These can be caught on all kinds of methods and set-ups and lure choice isn't always important for the smaller fish, but the bigger they grow the more they know, and you have to do a bit more homework to fool them. 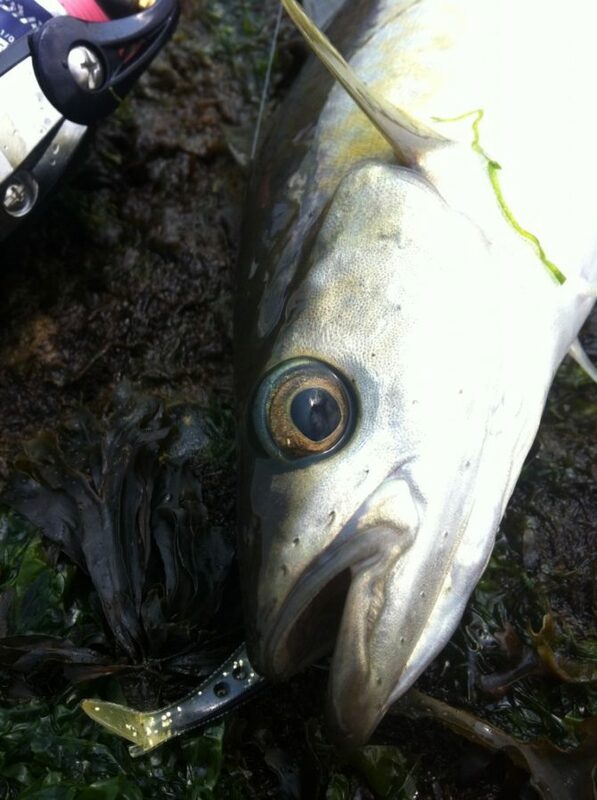 I always prefer a shad type plastic for Pollack and proved this on a recent trip when using tiny X-Layers. The Pollack would hit it hard but not connect. As soon as I switched to a similar size lure with a shad tail it was fish after fish. 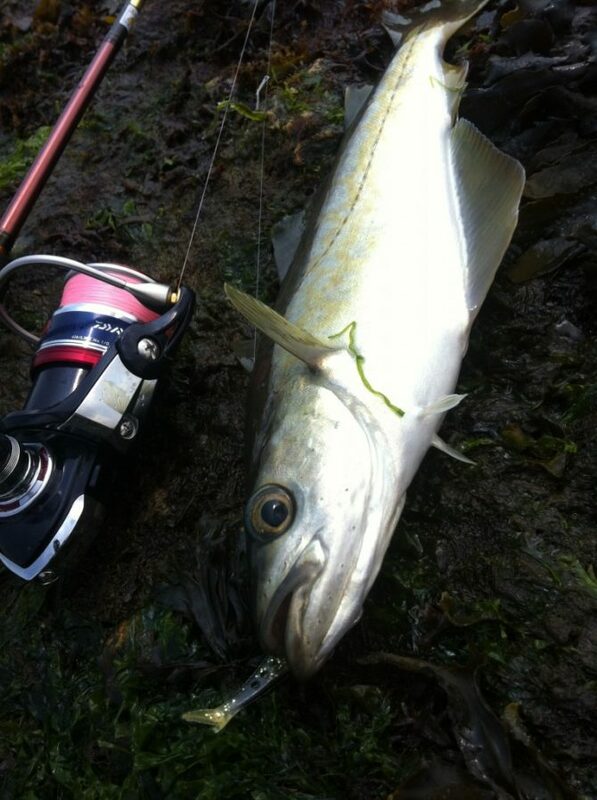 Its often the small changes that make the biggest difference, but when they are feeding hard they will take all sorts of lures. Lastly for now I have been waiting for what seems a lifetime to target Wrasse from my harbour marks. Whether it's a water temperature issue I dont know, but they are slow at becoming aggressive this year. 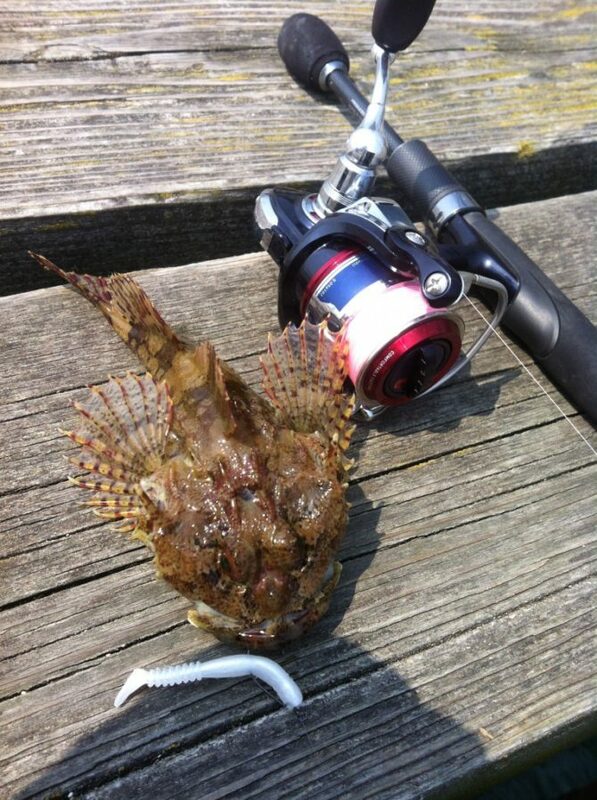 So when during a trip this week I felt the unmistakable thump of a Wrasse take, I was pleased. I was having a lure experiment day where I leave my 'go-to' lures at home and make myself mix things up a bit and for once it paid off. Money Bait plastics are very much like a small X-layer but a bit different in a way I can't explain! They just feel different but at the same time I knew there was a time and place where they would work and eventually they caught for me. Not a big fish, but after several more this size I was happy. I switched across to a Jacks LRF plastic and for some reason the Scorpions will sound out one of these a mile away. I had it rigged on a tiny Daiwa jig-head and if you have not used these before then search them out, as they are perfect for all kinds of LRF and I would be lost without them.